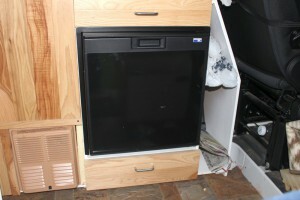 For our RV conversion we purchased a Norcold NB 751 3 cubic feet, 12 volt electric refrigerator. The big attraction of this fridge is that it uses the Danfoss BD35 compressor and is said to be very efficient on electricity use. 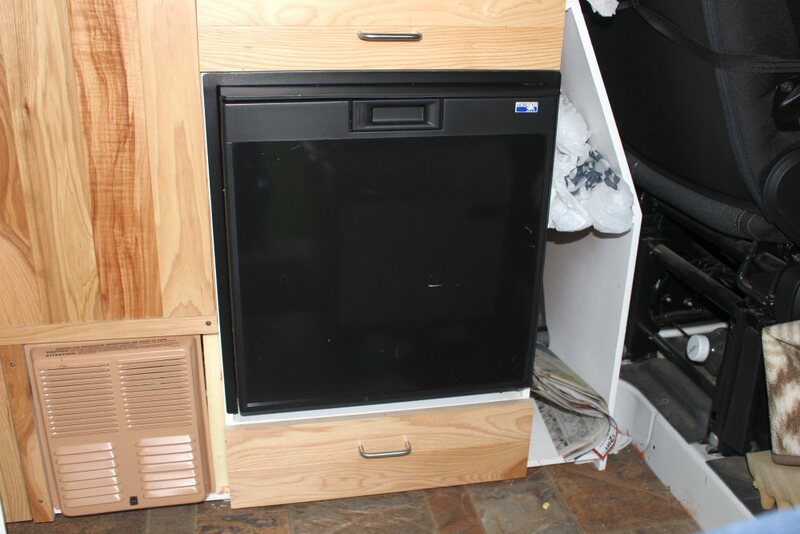 This is important to us in that the fridge is by far the largest electrical load in the RV. 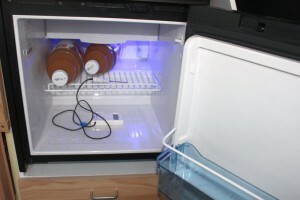 This test is about checking on what the fridge energy consumption actually is under typical conditions. In order to get an idea how much electricity the fridge uses, I bought an inexpensive watt-meter on ebay and set up a test to measure the electricity use for a full day. All the details are provided below, but the bottom line is that for this 80F day, the fridge used 42 amp-hrs (568 watt-hrs) for the full day. When the fridge is on, it draws about 3.6 amps, or about 50 watts with our typical 13.6 volt battery voltage. 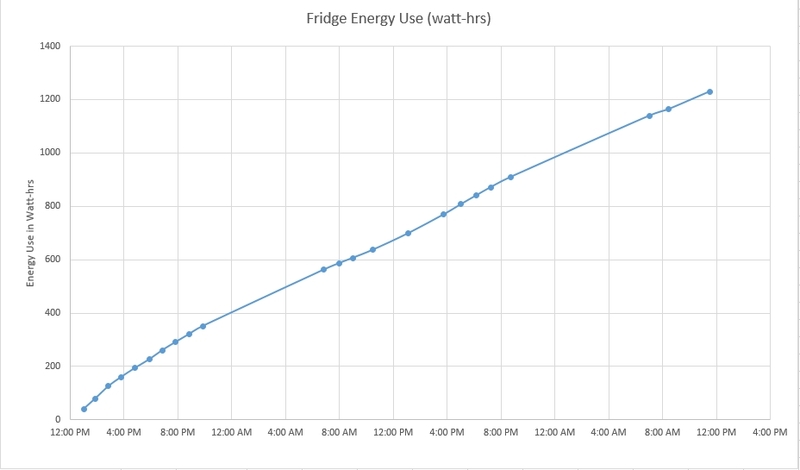 Based on the 568 watt-hrs per day, the average power use is about 24 watts, so the fridge ran about half the time during this test. So, I guess for these conditions, you could assume that the fridge will need about 42 amp-hrs for a typical day of use. You might want to allow somewhat more if you operate more in hot weather. For our house battery, we have two 6 volt golf cart batteries hooked in series to make an approximately 220 amp-hr 12 volt battery. If we allow the battery to discharge to 20%, then it has a useful capacity of 177 amp-hrs, and the 42 amp-hrs that the fridge pulls would be 25% of this useful capacity. Since our other loads are light, we can likely go 2 days without any charge to the battery. Since the solar charges some even on cloudy days, we can likely go longer than 2 days without running the van engine to charge the battery. When the fridge cycles on, the initial amperage is about 4.5 amps. Over about 2 to 3 minutes it settles down to about 3.6 amps and stays near this value as long as it stays on. I put a couple half gallon bottles of juice in the fridge just to provide some realistic thermal mass. These were initially at room temperature, and it took quite a while for the fridge to cool them down — I also think that they delayed the time for the fridge to reach the the optimal 40F ish inside temperature. The DC watt-meter is shown in the picture. Its a little hard to see, but if you click the picture to go to full size, you can see that it shows amperage upper left, battery voltage upper right, and wattage lower right. The lower left area rotates through: accumulated amp-hrs, accumulated watt-hours, peak watts, peak voltage, and peak amps. There are a bunch of them on ebay, but here is one example… about $20. To hook it up, you have to insert it in the wires that serve the fridge. This may be just me, but I’d probably not operate with this watt-meter permanently installed. I think its fine for tests like this, but it does not impress me as being a high quality instrument for long term safe use. It did decide about 3/4’s of the way through the test to reset the accumulated amp-hrs to back to zero and start over for no apparent reason. It says that its rated for 130 amps, but the wires coming into it are only 12 gauge — I don’t think I would want to leave it alone at these high currents. The plot above shows the energy use in watt-hours over the two day test. The 2nd day is probably more representative because in the first day I was adjusting the fridge thermostat and the fridge was having to cool down the two half gallons of juice which started at about 65F and were eventually cooled by the fridge down to about 35F. For the last 24 hours the fridge used about 568 watt-hrs, or about 42 amp-hrs. This is an average power use of about 24 watts. Since it uses about 50 watts when its actually running, this means it runs about half the time under these conditions. Our house battery has a useful capacity of about 175 amp-hrs, so the fridge load uses about 25% of this useful capacity over a one day period. For the overnight period, it should only bring the battery down about 10%. 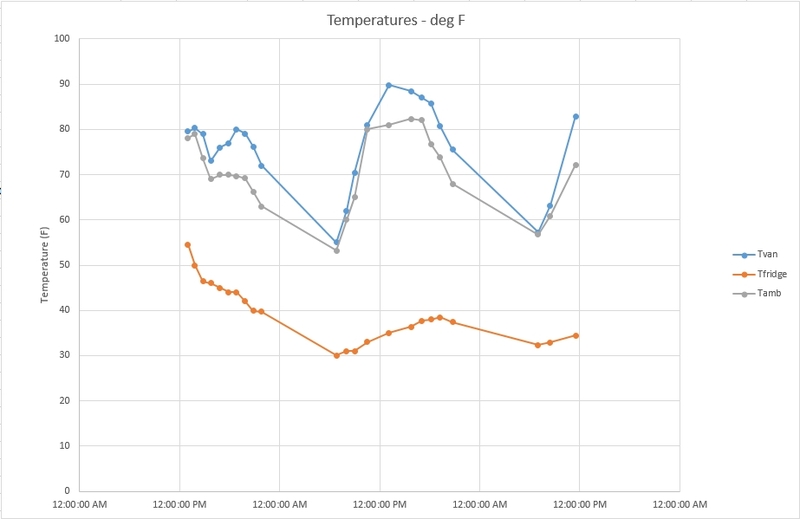 The plot above shows the temperatures inside the fridge (Tfridge in orange), temperature inside the van (Tvan in blue), and the outside ambient temperature (Tamb in grey). The freezer temperature varied from as low as -10F up to about 15F — this is with nothing in the freezer. At the start of the test, the fridge was loaded with two half gallon bottles of juice at room temperature. For the first few hours, the fridge is cooling that mass down and the temperature inside the fridge is running warmer than the recommended 40F. The fridge thermostat was also set to a higher (colder) setting during this time (not sure if that really makes any difference). 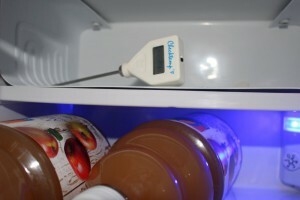 Eventually, the fridge catches up with cooling the juice down and maintains a temperature in the 30F to 40F area for the rest of the test — this is with the fridge thermostat set at just below “3” on the “1” to “5” thermostat scale. I have a brand new TAB 400 with a similar Norcold 3cuft. refrigerator that you measured. Using only the fridge and some LED lights the battery seemed to run down quickly. I had the setting on 3 or 2.5 most all the time. Since your test in 2015 it seems the refrigerator uses little power. Could I have a bum battery that charges rapidly but discharges rapidly as well? Thanks for any help. Nice trailer — just looked at a video tour of it — lots of well thought out design features. Not sure what you mean by “run down quickly”, but if you have the 235 amp-hr battery it should easily run a couple days with the fridge and some LED lights. If they provide a battery monitoring system (eg a Victron 700), then you should be able to fully charge the battery and then watch the amp-hrs used as the battery discharges. For a 235 amp-hr battery, you should be able to use about 120 amp-hrs before the battery gets down to 50% — if you can’t get that much out of the battery, then there is probably something wrong with it. I’d say you should be able to run your fridge and some lights for a couple days before you get down to 50%. To do this test, the solar charging should be off. With good sun, and 200 watts of solar, you should be able to run the fridge and some small loads indefinitely. If you have a way to measure the current coming out of your battery, it should be about 3.5 amps when the fridge is on, and near nothing when the fridge is off. Ours runs about half the time on a warm day. If the current is higher than this, then you have some other loads on the battery, or the fridge is drawing more power than it should. 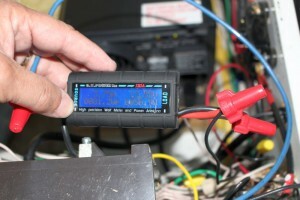 If they don’t provide you with a current reading, you can get a clamp on amp meter and measure the current by clamping the meter on the main battery wire. Just be sure the clamp on meter you get measures DC amps (some only do AC). If it is the battery, then I’d guess there should be some warranty coverage. Road trek has one 315 W and one 100 W panels which requires two controllers. 12 V nominal battery suite is half that of fifth wheel. System has 2.0 kW PSWI. We are currently on beach about 20 miles north of Tulum. Good to hear, and thanks for the followup! How have the Li batteries performed for you? Using electric on a 2 or 3-way fridge is extremely inefficient, as you are just powering a heating element. 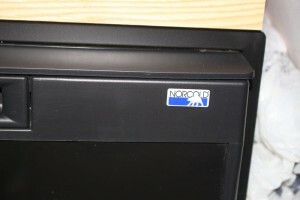 A fridge with a compressor like the Norcold or Steca (German made) is far more efficient and will require much less solar. If you have a 2 or 3-way, use propane except when driving or connected to power at a campground. Just what I’ve been looking for. Now we only need LP for the cooktop. We don’t plan on a heater as we really only camp in the summer. Thats for posting this! Thank you for the very detailed and informative report. It will be helpful when I buy house batteries for my conversion. You can follow along with my build at the ortontransit.info web site. Did smile about your future pee bottles in the fridge. That’s a really nice job you are doing on documenting your conversion. A request if you can easily do it: when you click on one of your pictures, it shows a full size version. No problem with WordPress. I type a question and you give a prompt and thoughtful answer. Hard to beat that. I was going with a 3-way cause it’s what I’ve had in 2 TT. But all the issues you mention and more have been nagging me. Actually got very comfortable knowing I had plenty of propane and no worry of losing power. Doing this build from ground up allows for some experimenting. Lots of great new technology for AC/DC systems has me convinced to rethink my strategy. Initially I wasn’t considering solar but all the success stories has me adding that to the mix also. That only strengthens the argument to go 2-way. However, I’m still having propane for heating. I really like winter travel with a warm shelter. We had a couple days on our last trip that were in the 90’sF. I did not measure the power to the fridge, but it seemed to handle those days just fine. The solar charger had no problem keeping up, but in some cases there was also some charging from the van engine. The battery would get up to float (fully charged) early in the day. My understanding is that the fridges that run on propane with only a flame (no compressor) are quite inefficient. I had one initially in our last RV and one of my goals for this conversion was not to have to deal with a propane fridge again. Between the not running except when it was level and the very slow initial cool down even when it was working it was hard to even tell if it was working at all. They do need to have two fairly large vents through the van wall — a low one to take in outside air, and a high one to expel the heated air. I did not like the idea of putting two more pretty large holes in the van wall. I guess one way to look at it is that on an 80F day, the fridge is maintaining an (80F-35F) = 45F differential — when it goes up to 95F, this becomes a 60F, or 1.3 times greater differential. Since it runs about half time at 80F, it seems like it might handle the extra 1.3 factor without running all the time? I guess one thing you could do is go for a better flow over the fridge coil — as in maybe add a fan, or have a vent that lets in air from under the van along with a fan? You might also look at the Engel fridges which are supposed to be quite efficient. I guess bottom line for me is that I was very glad to get rid of the propane fridge and would never want one again. Question: I’m new to WordPress, which is what this site is done on. I’m wondering how the comment system is working for you? Any problems? ANY EXPERIENCE WITH THE FRIGE AT 90F OR ABOVE? I frequent 95-100 and thinking the extra energy needed from 80F to 95F would increase nonlinear, maybe exponentially? I’m fighting the 3-way/2-way battle. I’ve seen no mention but it seems that all the heat generated by a 2-way gets put directly into the van, no? Has this been an issue for you? Can your 300W solar keep up with frig use in summer? Thanks for the nice expanded site. I’m using many of your techniques. Your new overhead looks great. Simple, functional, elegagant. Can you share how you attached it?